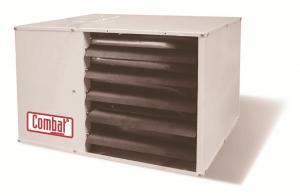 Unit heaters are available in a range of sizes from 7.1 kW Output up to 111 kW Output. The CTCU range are compact low output units, available in 6 zizes from 7 up to 32 kW and are designed to be ceiling suspended and for free blowing applications. Units are fitted with axial fans and cannot be ducted. The CTU range are larger units from 23 up to 111 kW [10 models] and are available as 4 versions: A units have axial fans for free blowing applications; B units have centrifugal fans and can be either free blowing or connected to duct work. C units have duct connections at front and rear for installing in a section of ducting and the D models are supplied without a fan for use in ducting with air supply from an existing or other source.